I usually don’t like a stickers on the notebooks. Especially the large one which after some time became dirty and ugly. Also, it isn’t very nice to open your laptop on the presentation in front of the 200 attendees while the laptop looks a like teenage room with posters on the wall. That is the main reason why I always keep my laptop nice and clean. But I changed my mind a few days ago when I heard about unixstickers.com project. 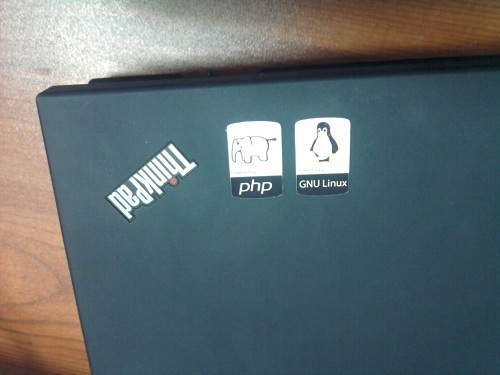 The main idea behind this project is to test the Linux user’s interest in customizing pc and notebook case with a sticker of a favorite distribution. Sorry for the bad image quality (the image is made with my phone because the Canon camera is not at home 🙁 ). You can see that stickers are very nice and small so they fits perfectly. Another good idea behind this project is that every time when someone buys Linux Mint sticker, they donate 0.10€ to Mint Linux project. Dude, is me or your stickers are upside down? Very nice idea, I’m ordering mine right now.